Penn Manor High School seniors got a boost to their post-high school plans when members of the Class of 2018 received 192 scholarships and awards totaling nearly $150,000 during the Senior Awards Ceremony on May 24. The honors included 61 scholarships and awards administered by Penn Manor Education Foundation totaling more than $61,000. Many thanks to the individuals, organizations and businesses that contributed to all the awards. The seniors also earned outside scholarships and aid to continue their education after graduation. 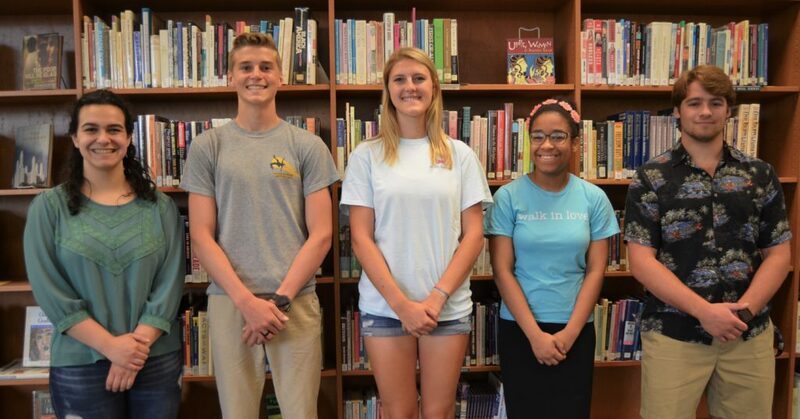 The top recipients of Penn Manor academic scholarships/awards were Veronica Cazillo, with 13 awards; Nicholas Fafel, with 12; Vincent Vozzella, with six awards; and Tiana Ferko and Debora Perez, with five awards each. Congratulations to all the seniors who earned awards, and best wishes on your future endeavors! Here are the awards, listed by recipient. To search for an award by name, open the list and type “control F” and the name. From left, Veronica Cazillo, Nick Fafel, Tiana Ferko, Debora Perez and Vincent Vozzella.